It's a busy weekend in Utah Valley! There are activities galore going on in honor of Easter and you don't want to miss out. Above is a quick list of cities offering free Easter egg hunts (as well as great prizes), and special brunches, concerts, and events. Make Easter extra special this year and create some unforgettable memories while you are at it. 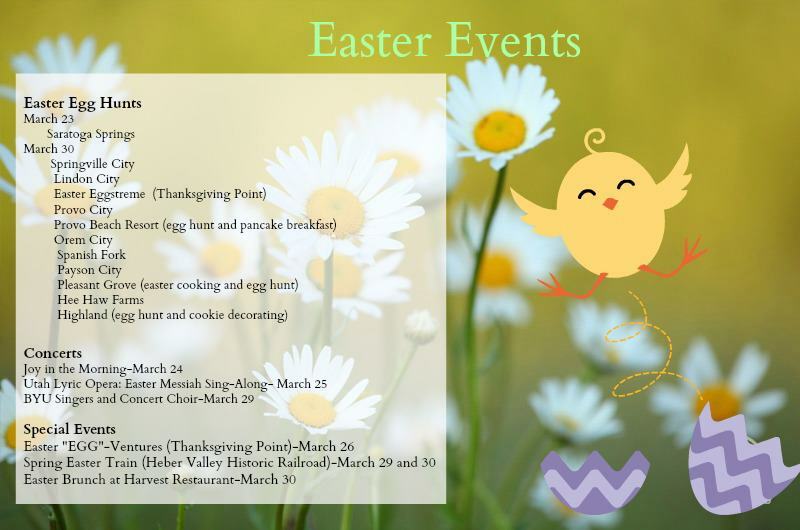 And if you are wondering what to do since you don't have any kids to take egg hunting, hop on over to the Easter Brunch at Harvest Restaurant at Thanksgiving Point (one of our favorites). Find out detailed information about all of these events at http://bit.ly/100DKmq. Find all the need-to-know info about Utah Valley at UtahValley.com. Hip-hip-hooopppy Easter everyone! May your week be full of sunshine and sweet treats.